As well as offering sanctuary to ponies that are severely traumatised, we also have a rehoming scheme for our rehabilitated ponies. 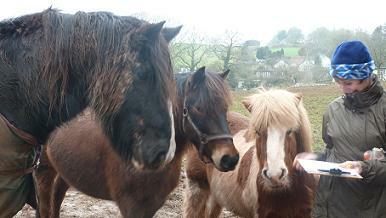 All our ponies go out "on loan". They remain in our ownership and have a legal loan agreement. New loaners will also be asked to provide 2 references - one of which should be from their vet. It's wonderful to see ponies happy and flourishing in their new homes and we currently have ponies out on loan as companions and/or riding/driving ponies. We homecheck each year and are always available if any loaners need any help or advice. 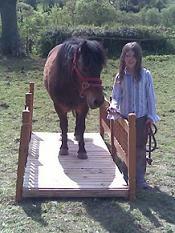 Loanees are expected to meet all the costs of caring for their pony, including any veterinary bills. We try to ensure we match the personalities and needs of our loan pony with the people and its new companions...resulting in long term happy homes! Basically an all round star pony! Health: Very good. Never had laminitis. Bisto has lived with Rachael since he was 2 years old and is a real part of the family. Rachael owns Bisto and we are helping her with finding him a loan home. Bisto was one of the youngsters from the original p4p herd. As you'll see from his description below, Rachael has done a fabulous job with Bisto and since she developed Multiple Sclerosis she has even trained Bisto to lead and be groomed alongside her mobility scooter. We will be assisting Rachael with the loan process - if there are periods where Rachael has difficulty with her health we will assist with the yearly home-checks and Bisto can come back to us if there is ever a problem. 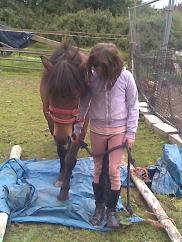 Bisto had been rehomed but it seems he was anxious being stabled at his foster home so has been returned. He didn't have a problem with this previously and this is something that can be worked on, or of course, he's perfectly happy living out. 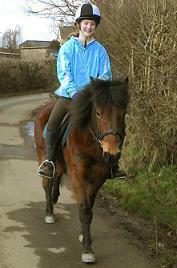 He's such a clever pony and he's suitable as a child's first ridden pony and/or a companion pony. This is what Rachael says about Bisto: "We have had Busy since he was 2, we spent 2 years just playing and walking around the village getting used to traffic and every day life. He then went on to Dan Wilson to start and was with him for 6 weeks giving him a really good start, he has been to local shows and done the fancy dress classes, done fun rides (on lead) and beach rides, he leads from another horse, and is generally a well behaved young man (now 11) he loves groundwork and would be an excellent agility pony. He has been brought up in an Intelligent Horsemanship home and keeping to those methods would help cement any relationship with him. He is a sensitive boy and likes a leader, he doesn't like to get things wrong and if he doesn't like something he will hide behind you and purse his lips, bless him. He has never had any cause to mistrust and has a good foundation, he doesn't kick, buck or rear, he will try and nibble fingers (well he is a pony!!) Never had laminitis, always good for the farrier and vet, fine with dogs and farm machinery. 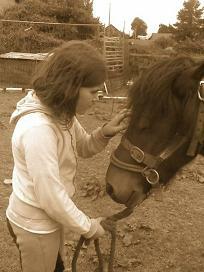 I have been doing a lot of long reining with him and planned to start him driving, he also loves logging. I am having to find Busy a new home as I have M.S and things have changed dramatically for me over the last year, He hasn't been ridden for a while but I will find a little local jockey to make sure he is all with that, but I am completely confident he will be fine, he is the kind of pony you can leave for a while , tack up and go out with. 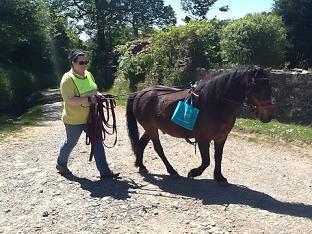 He's ridden mostly in his Dually headcollar as he's such a star but has also done riding with a bridle and bit. He leads from my scooter and whilst out long reining we have dragged cans behind him and the wheelie bin, used a motorbike and bicycles and even taken him out to watch a bike race, not a problem. I am quite limited at the amount I can do with him now and would love Busy to have more adventures".